Naha City’s pulling out all the stops this weekend to commemorate the 150th Anniversary of Commodore Perry’s first visit to Okinawa. 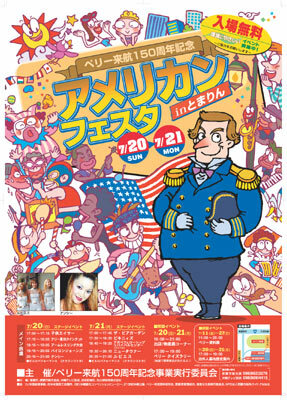 An American Festival in Tomarin, downtown Naha, is being staged Sunday and Monday, and a Perry Exhibition will run through July 27th. The festival is free, and open to the general public. Perry, commanding an American fleet, landed at Naha Port, hub of the Ryukyus, in 1853, then moved on to mainland Japan, bringing U.S. technology and opening Japan to the modern world and ending the country from its self-imposed isolation. Event organizers say they view Perry’s visit a significant event in Japanese and Ryukyu history, and hope it will promote future tourism to Naha. The organizers include Naha City, the Naha Tourism Association, Okinawa Television Network, Ryukyu Shimpo, American Chamber of Commerce in Okinawa, and the American Consulate Naha.